In 1864 General Sherman carved apart the Confederacy with his famous "march to the sea". 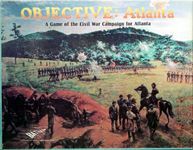 Can you stop the Union at Atlanta? In six different scenarios, this game portrays all the desperate action of the waning days of the American Civil War.